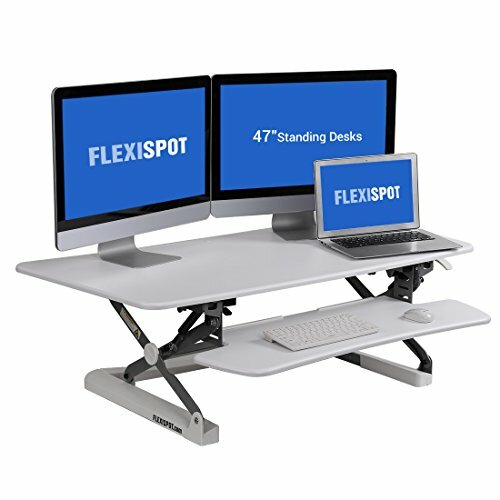 FlexiSpot's sit stand desk provides an easy way to transition between sitting and standing throughout the workday. Our large desk riser offers a spacious work surface and a removable keyboard tray. These quality workstations offer smooth up/down motion, twelve height adjustment settings and ergonomic monitor mount compatibility. 1. More Spacious Desktop Space: its generous 47"width allows to support two screens up to 27"
2. Smooth & Easy Adjustments - Our single-handle design makes it super easy to safely adjust the height of the desk. You never need to use two hands or extra force like with some other brands. 3. Straight Up & Down Movement - Our space-saving workstation rises and folds vertically, within its own footprint. There's no need to make the spatial accommodations that may be required with comparable products. 4. Quick-Release Keyboard Tray - Our full-sized keyboard tray features a deeper work surface to fit a larger keyboard, mouse, and mousepad as well as a unique quick-release design so you can quickly and easily remove it when you're performing tasks that don't require a keyboard and mouse. 5. Ergonomic Benefits for Every Height - Whether you're 5'1" or 6'1", you can comfortably shift from sitting to standing with 12 different height levels.